Ancient Balinese beliefs and practices have inspired the magical goings-on at the Sacred River Spa at Four Seasons at Sayan. 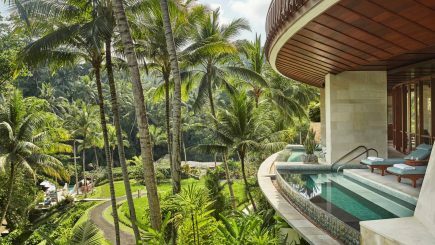 This Balinese luxury hotel really is a remarkable hideaway — when I stayed the Obamas had just holidayed here. Little wonder the readers of Travel & Leisure magazine just voted it their number-one favourite stay in the whole, wide world. Designed 20 years ago but a young architect from London, John Heah, the striking look and feel of this five-star resort’s curved contemporary building and its free-standing riverside villas is as compelling as ever. But it’s far from being a typical chain-hotel outpost. You’d be hard-pressed to beat the wow of any arrival here in leafy Ubud, in the heart of Bali — as your buggy driver zigzags down into their private pocket of this cinematic valley, you’re met with panoramic views of the Ayung River Valley framed by fragrant frangipanis and brightly-coloured bougainvillea and soundtracked by the whoosh of the river and tropical birdsong. Walk across the wooden walkway with a grandstand view of coconut groves, high above terraced rice paddies with nature at its grandest all around. Arrive at the top of the main building and the main bar and reception area is entirely open to the elements and with that theatrical setting always in widescreen. The Sacred River Spa promises unique carefully considered healing therapies focussing on your inner being, as well as all the beautifiers. Plan a bespoke, holistic itinerary in one of the private spa rooms or arrange to be pampered in one of the spacious spa villas overlooking lotus ponds and lush jungle. Chakra clearing, laughter yoga and rice-paddy-planting sit alongside more traditional treatments such as massages and facials — my age-reversing facial with Padmini was the most impressive youthifying, skin-plumping therapy I think I’ve ever had. Evoking a sense of awareness and well-being, all of the treatments are non-invasive and truly transformative — just being in this extraordinary enclave feels good for mind, body and soul. End your spa experience at the hotel’s infinity pool overlooking rice paddies, rainforest and river, where chilled face towels and fresh juices are served in abundance. One of the most original treatments I’ve ever had was my Sacred Nap here, floating from a bamboo bale in a silk hammock. Immersed in nature, with unparalleled seclusion this five-star spa in the heart of Bali’s buzzing creative capital you are cocooned and guided by the wisest of therapists, Fera. This relaxation technique coaxes away stress from every muscle and nerve, connecting you with nature and leaving you feel grounded and balanced — even if you’re the most sceptical of spiritualism cynics. Time at the Sacred River Spa could put anyone in a monk-like state of mind. Sayan; tel +62 361 977 577, fourseasons.com/sayanOpen daily 9am—9pm.